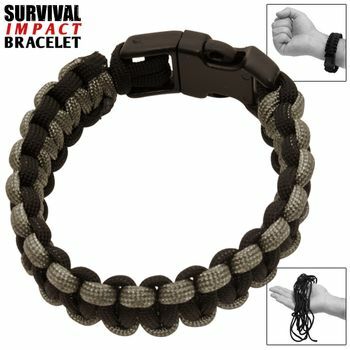 These state of the art survival bracelets are a must have in your arsenal when out in the wild, or just out and about. This tough bracelet can fold out into a 10-foot paracord and features a tight weave to remain compact. Fits most wrists comfortably up to about 8 inches in circumference. A typical paracord bracelet will contain eight to ten feet of useful rope. Once unraveled, the cord can be used for keeping items attached to a pack or vehicle, securing a tourniquet (in accordance with your training), or creating a makeshift handle for items you may need to carry or drag, just for starters. You can use the inner core strands as sewing thread or even fishing line. Let your imagination be your guide. This is a useful and convenient way to keep cordage close-by for camping, jogging, hiking or any outdoor excursion. Good item for your bugout bag and other prepper uses. This item is just a practical way for soldiers, firefighters, and outdoor adventurers to carry some extra 550 cord without taking up room in a pocket or pack which might already be full. The cord can be used for many useful things, like part of a makeshift bow and arrow set, nooses and triggers for your animal traps, part of a bow and drill fire starter and very simply a replacement for a broken boot lace or pack strap.